Before you roll your eyes at yet another game infused with an innovative morality system, consider the arresting E3 2009 debut of Army of Two's co-op morality. Fist-bumps and standing back-to-back while shooting machine guns...those were some of the signature elements of co-operative, two-player gaming in EA's original 2008 shooter Army of Two. 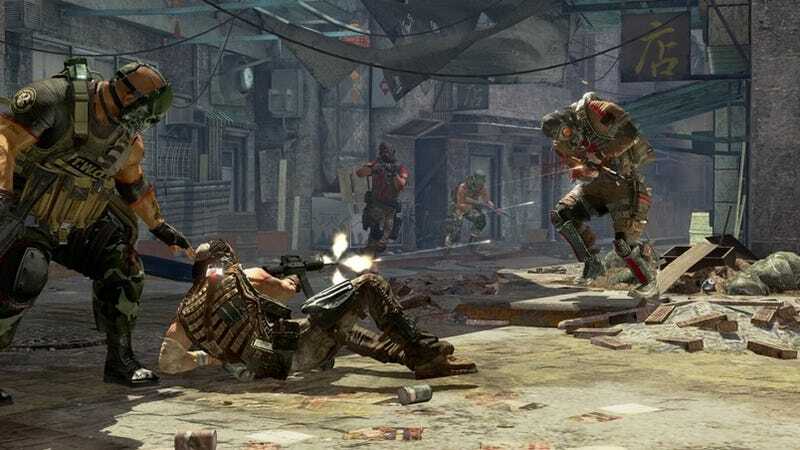 For the upcoming sequel, Army of Two: The 40th Day, an E3 demo last week displayed a brave new idea that may stick with new players more strongly: co-operative moral choices. For years, video games have asked individual players if they would kick a dog or feed it, but they've seldom — ever? — asked two players to decide the fate of that proverbial dog together. The new Army of Two will. Its ethical decisions are made to confront two players at once, with only one outcome per pair allowed. The co-op morality scene I was shown in a darkened room in EA's E3 booth occurred mid-mission when the game's two mighty soldiers-for-hire came upon a stash of weapons. A guard — an older gentleman — caught them and, with shaky revolver in hand, asked them to leave the guns lest he get into trouble. On both of EA's TVs that were running the game demo for its two players, a choice was presented. It was represented by two button icons on each screen: take the guns or leaving them. The moral choice presented wasn't the most interesting one I'd ever seen in a game, but the manner in which it was presented was fascinating. The players weren't asked to vote. They weren't told that only one of them could make the decision. Either player could make the choice using their own controller, and that would be the choice for both of them. The first button press on either controller was the only decision they'd get to make. They'd have to live with it, whether they'd talked it through or if one of them had just mashed the A button first. Anyone who has been in a long-term relationship or had a close friend can see what might become of Army of Two's co-op morality system: arguments, hurt feelings over rash judgments, a sense of dependence on one another and the struggle to subdue one's own kneejerk reflexes in order to sort things out as a couple, as a pair, as a team. That's fresh ground for games, as far as I know. Sure, Army of Two: The 40th Day has other fancy new features. It has an improved gun-customization editing interface that lets players mix-and-match gun parts as if they were Legos. Sure, it lets players waging a firefight to select from a quiver of co-op moves — including a mock surrender-and-snipe scenario — depending on the enemy they face. Sure, EA is promising less of a frat-house tone for the new game, more intense action and battles set on the sides of collapsing skyscrapers. Sure, there's a little boy running around in this macho game about war for reasons not yet explained. And, sure, the game has the intriguing mechanic of rewarding players a set amount of dollars (undetermined as of now) for each civilian they save from death. But the most interesting thing I saw in Army of Two: The 40th Day was co-op morality. Who would you trust to play a game like this with? The kind of person who harvests Little Sisters in BioShock? The kind of person who chooses to heal the citizens of Infamous' Empire City? The kind of person who would save their family in Fable 2? Or the kind who'd let them die? Morality in games won't be such a lonely thing in games once Army of Two's sequel hits. The game is slated for winter release on the Xbox 360 (the version showed to me) as well as the PS3 and PSP.